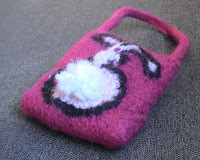 Bunnies Got Back - a knit and felted Bag Pattern great for beginners interested in trying out intarsia! I know spring is here when I see an abundance of those fluffy little white tails hopping away from me as I make my way back to the outdoors. When it warms up outside it means I can size down to a small on the go bag which can be worn on my wrist, or thrown in my ever present big bag if need be. What shouts springtime more then bright pink, green and white? About the sweet and silly pom-poms, well, spring makes me feel giddy. The bunnies aren’t the only ones showing there tails in the sun. The two Pom–poms are made in Lamb’s Pride Bulky yarn.You will need approximately one yard of white for bunny’s tail, and one yard of green for bag closure pom-pom. around to work back on the WS, slide all sts to the other end of the needle, switch the needle back to your left hand, bring the yarn around the back of the work, and start knitting the sts again. After the first 2 sts, give the yarn a sharp tug. Repeat this row to form I-cord. After a few rows, the work will begin to form a tube. m1 make one stitch by inserting left needle, from front to back, under the horizontal strand between last stitch worked and next stitch on left hand needle, forming a loop on the needle, knit through the back of this loop. Bag is worked from; the small loop closure down the front of bag following colorwork Bunny Chart from the top of chart, Row 20 (then 19,18, 17 and so on) down to row 1, then up the front of bag. Embroidery details are done before felting. Next bag is assembled and wrist strap is knit. Bag is then felted. Pom-poms are added after bag is felted. 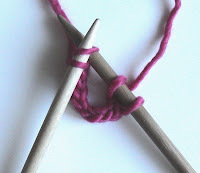 The picked up stitches will initially be very tight however they will loosen up as soon as you knit across them. 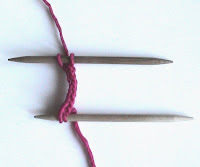 Connect those two sets of stitches by knitting the 2 stitches of your left hand needle onto the right hand needle keeping tension as even as possible (4sts.). You are now ready to begin your increases. Next: Continue in Stockinette Stitch for 7 inches ending with a purl row. Next row : On the right or knit side , bind off all stitches. With right sides facing and MC sew sides seams together as close to edge as possible with whip stitch. Turn bag so right side is out. Pick up 3 stitches as evenly as possible directly over side seam where bag is seamed together. I-cord those 3 stitches for 14 inches (40 rows). Bind off and sew that end onto other side of bag over other side seam so strap is evenly attached. Create 2 small (1-2 inch) pom-poms, one in white and one in green. Pom-Poms do not get felted so do not attach pom-poms until after bag is felted. With tapestry needle and [A] work chain stitch around bunny adding an extra stitch to accent bunny nose profile. Place your finished bag inside a zippered pillow case (not laundry mesh bag), add an old pair of rubber flip-flops or jeans (for extra agitation) to washing machine set on hottest temperature. Use a little laundry soap. Turn machine on and it will do the felting for you. If you are new to felting run machine on short cycle (15-30 minutes) and check to see felting progress. Felt the bag until it's the size and texture you desire. 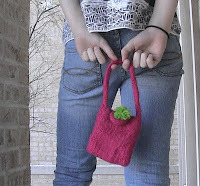 Under-felting leaves stitch definition and bag will be floppy with knit-like structure. Over-felting leaves bag over shrunken and destroyed so watch your progress until you understand how felting works in your machine. When finished felting stuff with old plastic grocery bags to desired shape and air dry. Sew on pom-pom bunny tail smack dap in the middle of bunny backside. Sew on closure pom-pom 1 inch below top of bag back so closure loops fits nicely over it. All content and photos are the property of She-Knits©.